By Devin Heilman, originally published in the Coeur d’Alene Press. This is the second in a three-part series that explores the lives of families touched by Alzheimer’s. This incurable and frightening “silent epidemic” affects many people in our community, from the patients losing themselves to the loved ones who watch them slowly disappear. Tess Freeman/Press: Betsy Sears watches her husband Ron Sears fiddle with a box of dominoes at Rose Terrace Cottage on a Wednesday morning. Ron was diagnosed with early onset Alzheimer’s in 2008 and moved into Rose Terrace Cottages in Dec. 2014 to receive full-time care. Betsy visits Ron everyday. “No matter what happens to his mind I know that his spirit is still there,” Betsy said. People who meet Betsy Sears may not immediately realize the tower of strength within her. Pleasantly sweet and soft-spoken, Betsy’s world has been turned upside-down by Alzheimer’s. She recently made the extremely difficult to admit her husband, Ron, 68, into a full-time care facility where he is under constant supervision. Ron’s dementia with Lewy bodies (abnormal masses of protein in the nerve cells) has become too much for her to manage. It’s now just her and the cat in their quiet Coeur d’Alene home, and the peace with which she is blessed. Ron never really received an absolute diagnosis, but all signs point to Alzheimer’s with Lewy bodies – rigid muscles, a shuffling walk and other movement symptoms. He was in is 50s when he started complaining about his memory, Betsy said, even though she didn’t notice anything. It wasn’t until Ron returned from a family trip that Betsy talked to one of his sisters, who was positive he had the disease because their mother had suffered from it. Ron, who was a painter by trade, stopped working in the fall of 2007. His inability to follow directions was frustrating his boss and he had a terrifyingly close call where he almost fell because his reflexes failed him. “He was up high on a ladder and reached for the wrong thing, but was fortunately fast enough to reach for the right thing and keep from cracking his skull open,” Betsy said. In January of 2008, Betsy accompanied Ron to a memory clinic. He was showing symptoms of depression and exhibiting signs of early-onset Alzheimers, which affects people in their 40s and 50s. Betsy said the tests and MRI the doctors conducted made it clear that he had a problem and they recommended she apply for disability. But somehow, Ron didn’t lose his sense of humor. Ron’s condition progressively got worse and he lingered in the middle stage of Alzheimer’s for several years. He became restless; he would get out of bed because he didn’t know his wife of 42 years, he kept turning off the wall heater without knowing how to ignite the pilot light and he thought their son was an intruder. He’s now nearing the end of the middle stage and entering the late stage. Betsy kept him home as long as she possibly could, but as his condition worsened she knew she could no longer care for him and maintain her own sanity. And she said she didn’t want to resent him. 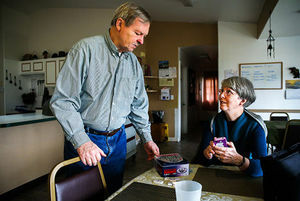 “It became more and more clear that I couldn’t leave him alone for more than two or three hours, and it got to where I couldn’t leave him alone for even that long,” she said, explaining that professional in-home care was something they just couldn’t afford. Ron has been a resident at Rose Terrace Cottages since mid-December. It’s a homey assisted living and residential care facility where he lives with other men in similar conditions. Betsy said she knows he’s safe there, and he has a friend on whose shoulder he rests his hand as they shuffle around together. Betsy’s really happy about that. Betsy sees Ron as much as possible, but she will continue to live her life and do things she couldn’t when he was home. She spends time with her siblings, with whom she is very close, and she has a very strong faith. Years ago, she said she observed how others around her were suffering and questioned why God was so good to her.